As with Anna’s other board books, there’s not a lot of text, although it does have a nice rhyming lilt to it. 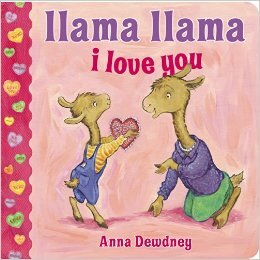 Anna’s illustrations are bright and fun, and Llama Llama is as sweet as ever. I agree there’s a missed opportunity here. It would have been nice to see a focus on love itself rather than celebrating the holiday. However, tiny readers will most likely spend their time thumbing through the pages and studying the images rather than paying too much attention to the words. It also serves as a starting point for parents to further the discussion about love and Valentine’s Day as a whole. © 2015 – 2017, Cracking the Cover. All rights reserved.